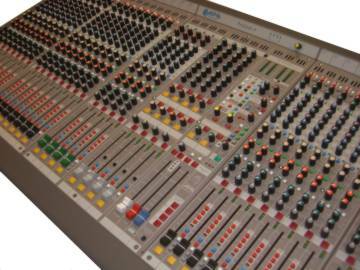 Making its official U.S. debut at InfoComm 2008, Booth C4769, APB-DynaSonics introduces the new analogue ProDesk-4 small format console in 16, 24, 32, 40 and 48 mono mic/line input channel formats, ProDesk-4 includes 4 Stereo Line Only input channels, each selectable from two different input sources and controlled from 100mm faders with stereo EQ and access to all aux buses. All mono input channels also include internally illuminated Mute and PFL switches, 6 segment channel metering, 48 Volt Phantom Power switch with LED, mic/line, Pad and Polarity Reverse switches. The ProDesk-4 input channels are similar to those used on APB-DynaSonics' ProRack mixers, while the cosmetics are identical to Spectra consoles. The high quality side panels, armrest, and bridge assembly are modeled on Spectra. ProDesk’s internal electronics and components are derived directly from the successful Spectra and ProRack designs. At the heart of ProDesk-4 is APB’s wide bandwidth circuitry, most noticeable in the microphone preamps, EQ, and summing amplifier and output sonic performance. A solid mechanical structure designed to endure tough road conditions protects the electronic circuitry and provides a comfortable but solid work surface. Six auxiliary sends are switchable pre/post fader in pairs and pre/post EQ as a group and include one pair of auxiliary sends that are switchable between mono and stereo operation. The discriminating 4-band EQ has sweepable mid-frequencies with a 1-octave bandwidth and EQ On switch with LED, Variable High pass filters with a 20Hz-400Hz with On switch with LED. Outputs include four analogue subgroups, 4 matrix outputs, Left/Right, Center, and Mono (subwoofer). All include XLR Balanced output connectors; TRS pre fader insert points, and TRS-Balanced bus inputs. Other ProDesk features are a digital USB Stereo Input and Record Output; remote muting of all primary outputs using a single Euro connector and the use of mother and daughter board construction for easy service and high vperformance. A plug in power supply ensures reliability, while an optional redundant power supply can be added to all but the 16 mono input chassis systems.